The new Titans comic has been unabashedly starring Wally West, with the rest of the Titans feeling a bit like backup dancers. 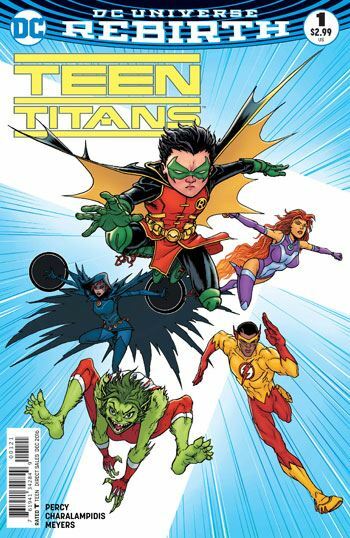 I have to admit, this debut issue of Teen Titans, which follows directly on their Rebirth special, feels like it’s going down the same road, but with Damien Wayne at the wheel. Not that I am really complaining about that. Benjamin Percy and Jonboy Meyers do an excellent job with this issue, turning the entire concept of a recruitment drive on it’s head, as Robin explains to Starfire, Raven, Kid Flash and Beast Boy why he has kidnapped them all. Damian is written the way I like him best. A manipulative and cunning little jerk, who nevertheless has really solid reasons for his atrocious behaviour. In other words, Batman, Jr.
Damian gets to explain in great detail the strengths and weaknesses of the youths that he has captured, and argues convincingly how they would be best served by uniting. It’s a credit to his persuasiveness that he gets them all, even Starfire, on his side. Rebirth, and all the reality warping events of the past few years, have left me in a bit of a muddle about the relative ages of the characters. The issue marks Damian’s 13th birthday, and it is abundantly clear that he is meant to be the youngest one on this team. But I do get confused when it comes to Raven and Starfire. They were about the same age when introduced so long ago in New Teen Titans. But Raven’s current ongoing series has her in high school, while Starfire’s recent series, and her role in Red Hood and the Outsiders before that, seem to put her up in her 20s at the youngest. The conclusion reveals the master villain that the team will have to face. While it is not someone that the Teen Titans have dealt with before, the villain does fall very firmly into the pattern of many of the great Titans foes.